In this fiercely competitive world of business, where customers’ demands increase rapidly, companies are focusing on advertising and personal selling to stay ahead. This puts intense pressure on field sales people to meet their targets. Often, salespersons find themselves travelling for long hours, meeting different kinds of customers, but still unable to achieve their targets. This results in considerable stress. So, how can they work effectively without being stressed? Efficient time Management goes a long way in overcoming stress and reaching the sales targets. 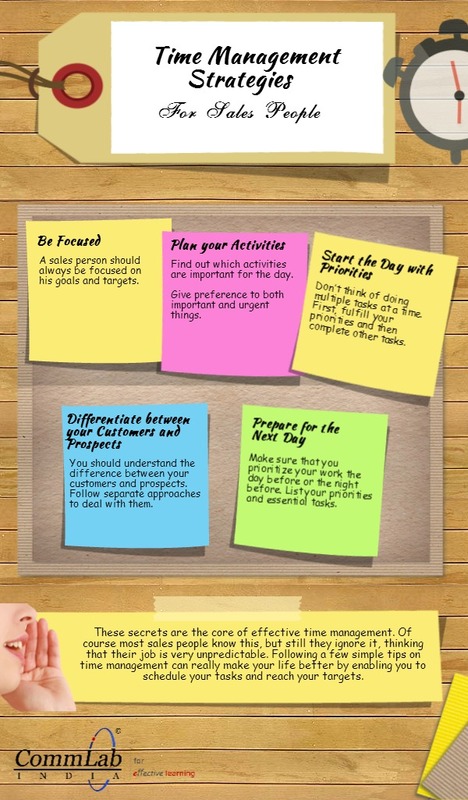 Let us now see some very useful tips about time management. Thus, these tips help sales people to make the best use of their time. I hope you find this post useful. Editor’s Note: This post was originally published in June 2014 and has appeared in learning design category whereas now it is updated in Training solutions category. 5 Sales Training Tips to Make Your Sales Reps ‘The Experts’!